- Sportiness combined with luxury prestige. - Somewhat expensive to repair. - Non-linear power delivery, with barely any low-range power and torque. 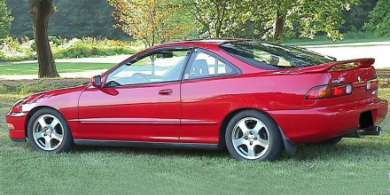 The Integra GS-R provided legions of tuners with the perfect base car. The GS-R coupe and sedan, positioned between the base model and the mighty Type-R, lasted for 8 years without external changes. It has now been replaced by the more powerful RSX Type-S, which is only available in coupe form. The Integra boasts Honda's much-advertised VTEC engine and four-wheel independent double wishbone suspension. The pre-'00 high-revving 4-banger engine gives out a burst of power in the higher rpm band thanks to the variable cam timing changing over to high-performance mode, and the complicated suspension setup provided excellent handling characteristics for a front-wheel-drive car. The car's design is still fresh by today's standards, and those who like to tinker with their rides can find ample performance parts at every auto-parts store. The Acura also has the distinction of being a luxury brand, so owners can feel a certain sense of prestige. Fuel economy is almost on par with the base 140 hp engine. 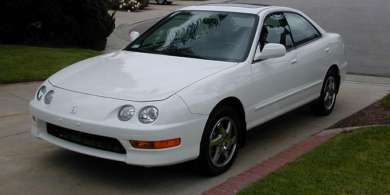 The Integra range continued until the 2001 model year, almost unchanged. Mind you, the sporty GS-R trim only comes with a manual transmission. The car features rock-solid Honda reliability, but repairs can be a little on the expensive side. Also, many of the coupe versions may have been in the hands of drag-racing kids. 0-60 mph : 7.1 sec.